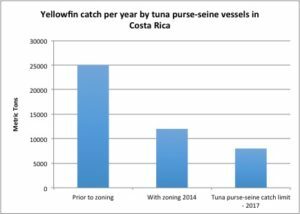 In 2014 President Luis Guillermo Solis signed a Tuna Decree prohibiting tuna purse sein operations within 45 miles of the coastline of Costa Rica. 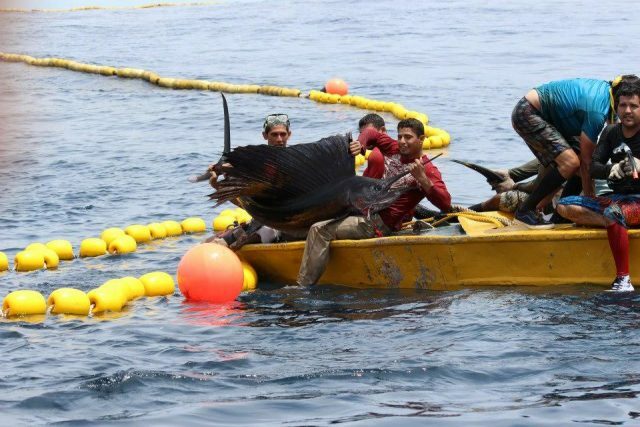 Other important areas and sea mounts were also protected effectively prohibiting tuna netting operations in over 200,000 square kilometers of territorial water. This Tuna Decree was sponsored by FECOP, a Costa Rican nonprofit sport fishing Federation made up of 7 sport fishing associations encompassing Costa Rica. FECOP’s director of science, Moises Mug has been monitoring the results ever since as a part of the original agreement which not only includes fish stocks but also investigating more sustainable ways to supply the Costa Rican cannery with product. Before the agreement 44 foreign tuna boats were operating, with 25,000 metric tons of tuna were being captured annually with only 36% of the catch going to the local port. The rest were being delivered in foreign ports. Costa Rica’s governing body for fishing regulations, INCOPESCA, has put a temporary ban on new licenses for foreign fleets, (there are no Costa Rican flagged purse sein boats) until the end of the year. Hopefully this is a preamble of the new proposed tuna regulations. The new proposal will allow for only 7 to 9 licenses sold annually and a quota limit of 8,000 to 9,000 metric tons with all fish going to the local cannery. “This measure will reduce the bycatch impact tuna purse sein fisheries have on marine mammals, billfish, sharks, dorado, wahoo and sharks”, explained Mug. This is great news also for spinner and spotted dolphins who have a symbiotic relationship with yellowfin tuna in the Eastern Tropical Pacific. Dolphins are often netted and later released in the process of catching tuna, though not without some injuries. 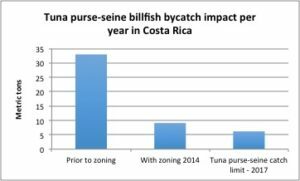 The actions have reduced billfish bycatch in Costa Rica by purse seiners by 70% from over 30 metric tons annually to just over 5 metric tons. FECOP is currently investing over $100,000 in an ongoing co-project with two government agencies, INCOPESCA and INA, a technical learning institution where all people working on a boat must be trained and certified. The project includes learning to fish “green sticks”, a selective type of fishing with no bycatch, as well as the proper handling of their product to receive best market value. As longliners eventually begin using this method, the bycatch of billfish on longlines will be drastically reduced. The public demand for sustainably caught seafood is a boost to the project. Is teamed with Gray Fish-Tag research granting Costa Rican University students scholarships to study species related to sport fishing. For more information contact info@fecop.org or check out more about fishing in Costa Rica. 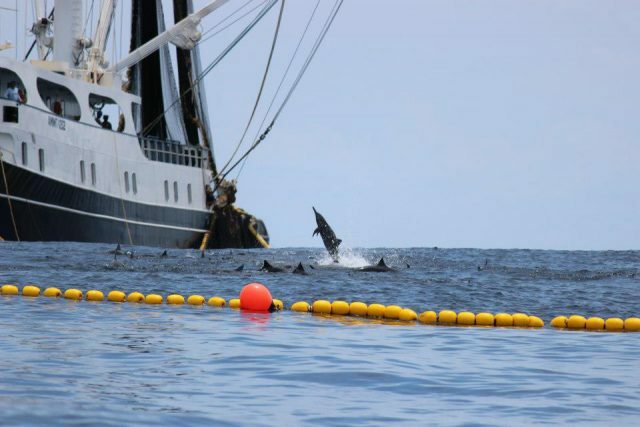 Photos of spinner dolphins caught in tuna net and sailfish bycatch courtesy of Divine Dolphin, Costa Rica.